The match tomorrow Saturday October 14 between Sri Lanka and the Windies would be to determine who goes in which group. The winner would be placed in Group B along with New Zealand, Pakistan and South Africa. The Windies secured their qualification with a ten-wicket win over Bangladesh Wednesday. Bangladesh folded for 161 in 46.3 overs. The Windies, steered by an unbroken opening stand between Chris Gayle 104, and Shivnarine Chanderpaul 52, cruised to 164 off 36.4 overs. Before that, the Windies made light work of Zimbabwe, with a nine-wicket win in a low scoring encounter. Zimbabwe fell for 85 and the Windies needed 14 overs to complete their routing. The preliminary round of the ICC Champions trophy runs to October 29. The two top teams from each Group progress to the semifinals carded for November 1 and 2. The winners meet in the final November 5. 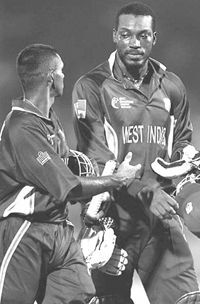 The West Indies won the last ICC Champion trophy in England 2004.